During December 2002 a salvage excavation was conducted at the Holyland Park site (Permit No. A-3785; map ref. NIG 2180–1/6295–6; OIG 1680–1/1295–6), in the wake of construction work. The excavation, on behalf of the Antiquities Authority and financed by the Holyland Park Company Ltd., was directed by I. Milevski, with the assistance of K. Ben-Or, R. Abu-Halaf (administration), V. Essman, V. Pirsky and T. Kornfeld (surveying and drafting), Y. Nagar (physical anthropology), L.K. Horowitz (archaeozoology), and J. Seligman and G. Solimany. The excavation was a continuation of fieldwork that had begun with O. Negbi (HA 10:12–13 [Hebrew]) and S. Ben-Arieh (‘Atiqot 40:1–24). 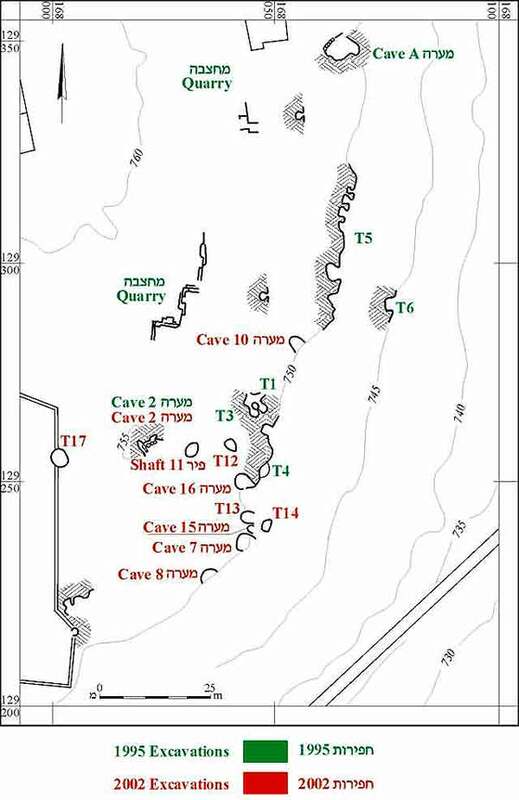 The excavation of Cave 2, which had begun by Ben-Arieh, was completed and ten other caves and shaft tombs were excavated (Fig. 1).
. The plan of the cave’s eastern side (9 × 10 m) was completed. Following the removal of the collapsed ceiling, a layer of terra rosa soil that overlaid a gray soil layer on bedrock, was discovered. Bedrock served as the floor of the cave and two hearths were found above it. The ceramic assemblage dated to Iron II and the Persian period, similar to the artifacts from Ben-Arieh’s excavation. Animal bones were also found.
. This cave (3.0 × 3.5 m, height 1.8 m) was located southeast of Cave 2 and c. 5 m below it, at the end of a bedrock terrace. The cave had collapsed in the past and was covered with a chalk layer from the ceiling that superposed a light brown soil layer on the floor of the cave. The main finds consisted of potsherds from Middle Bronze II, several animal bones and a few flint implements.
. This cave (4 × 5 m, height 1.9 m) was located 20 m south of Cave 7, at the same end of the bedrock terrace. A shaft (diam. 1.3 m, depth 2 m) at the northern side of the cave accessed its entrance. As in Cave 7, this cave had also collapsed in the past and was covered with a chalk layer that covered a light brown and yellowish brown layer above the floor of the cave. The ceramic assemblage is dated to Middle Bronze II and the discovery of human bones, as well as animal bones, indicates the cave was used for interment.
. This cave (2.5 × 6 .5 m, height 2 m), c. 25 m northeast of Cave 2 and on a lower bedrock terrace, had been cut by mechanical equipment and therefore, it was impossible to determine its exact width. The cave was covered with terra rosa soil overlaying friable limestone and grayish brown soil layers above the floor. A hearth was in the center of the cave and other finds included potsherds, mostly jars, from Middle Bronze II, flint implements and animal bones.
. A natural shaft (diam. 1.2 m, depth 1.6 m) 10 m east of Cave 2. Potsherds from Iron I and II were found inside and around the shaft, as well as on surface. 12. This shaft tomb, located c. 17 m east of Cave 2, on the bedrock terrace of Caves 7 and 8, consisted of a shaft that collapsed and an oval burial chamber (2 × 4 m), which was filled with debris of modern refuse. The excavation was not completed.
. This cave, c. 10 m north of Cave 7, had collapsed in the past and only its southern end survived. Potsherds from Middle Bronze II and human bones were found. The excavation was not completed. (?) 14. This tomb was located c. 2 m northeast of Cave 7. Only the elliptical burial chamber (1.5 × 2 .0 m, height up to 0.6 m), covered with grayish brown soil, was preserved. The sole artifact from the tomb was a clay lamp, dating to Early Bronze IV. Cave 15. The excavation in this cave (4.5 × 7 .0 m, height 1.2 m), located between Caves 7 and 13, did not reach the floor and was not completed. A dark brown soil layer in the cave overlaid a chalk layer above the floor, which yielded most of the potsherds that dated to Middle Bronze II, as well as human and animal bones.
. This plundered cave, to the north of Cave 13 and south of Cave 12, was tunnel-like (length 6 m, width 1 m) and devoid of artifacts or potsherds, other than a few animal bones.
. This tomb, c. 20 m west of Cave 2, was exposed by mechanical equipment after the conclusion of the excavation. It included an entrance shaft, blocked with stones, descending into a chamber that accessed another chamber, which had been cut by mechanical equipment and was excavated, but was devoid of finds.